Schubert’s Bakery is celebrating its 94th anniversary. One of the area’s oldest bakeries, Schubert’s first opened its doors in 1911 on Fillmore Street. Since the 1940’s, the bakery has been at its present location on Clement Street. Throughout the years, our talented bakers have dazzled customers with their delectable creations. 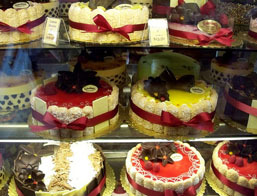 Schubert’s has a variety of delicious cakes for any occasion. Schubert’s has many cakes and pastries though I would definitely recommend Schubert’s special cakes, the Italian Rum Cake, Chocolate Truffle Torte, or the Tiramisu Mousse. Not a chocolate fan? Well then I’d choose the Raspberry rum cake or try out Schubert’s cookies or pastries. Whether you prefer a delicate croissant, a bran muffin or a scone, a turnover, Schubert’s is the place to go. Our repertoire, which draws on many European traditions, includes cherry and apple tarts, pies, coffee cakes, Danish pastries, croissants, puff pastry items, scones, muffins, almond tarts, pound cakes, and large variety of cookies, superb cakes, and much more. Schubert’s most popular cakes are for their mousse cakes. Rich in flavor, yet surprisingly light. Mango mousse and Chocolate mousse are their top sellers. For those who desire something richer, their Opera cake cannot be beat.